WITH 360-DEGREE CAMERAS hitting the market, all of them are simply a collection of normal camera lenses which stitch together footage to create a spherical image. But a new and better method to capture such images is in the works. Researchers from Columbia University’s Computer Vision Lab have developed a flexible sheet which can act as a camera. 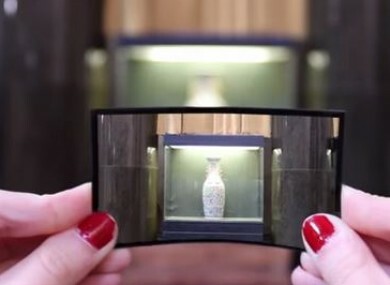 It can be attached to any surface, and can take photos from angles that aren’t possible with conventional lenses. It can be wrapped around objects like a car or lamppost to help see blind spots or take 360-degree shots. If a person is holding one of the camera sheets, which the researchers see as taking the size of a credit-card, they can bend it to change its field of view. The more you bend it, the more scenery it’s able to take in. For now, the camera is simply a proof of concept as the image quality from the prototype is low-resolution. The team plan to create high-res versions of the same sheets although cost could be a barrier to this being rolled out. The researchers say if it could be printed out like a roll of plastic sheet at low cost, it would help capture images that aren’t possible now. Email “This bendable sheet just happens to be a functioning camera ”. Feedback on “This bendable sheet just happens to be a functioning camera ”.